On the western edge of the South-West Townships of Johannesburg, also known as Soweto, lies the community of Braamfisherville. I once visited this community, accompanied by colleagues from the HIV organization I volunteered with at the time, to invite a group of orphans to a Christmas party. Comprised mostly of South African goveirnment-built RDP homes, there’s nothing fancy about this township. Rather, I was struck by the sheer poverty of the orphan family we visited, and how their lives were far from aligning with the vision of the community’s namesake. Bram Fischer is somewhat of a folk hero to many South Africans, but to nowhere near the degree of Che Guevara, whose image in South Africa is likely more commonly enshrined than Jesus’. A former leader of the South African Communist Party, banned by the apartheid regime, Bram Fischer is mostly remembered for leading the legal defense during the famed Rivonia Trial in 1963 – 1964 — the event that sent Nelson Mandela and other members of the African National Congress to political prison on Robben Island for nearly 30 years. Fischer himself was arrested in 1965 for being a Communist, imprisoned in Pretoria, and died while under house arrest in 1974. 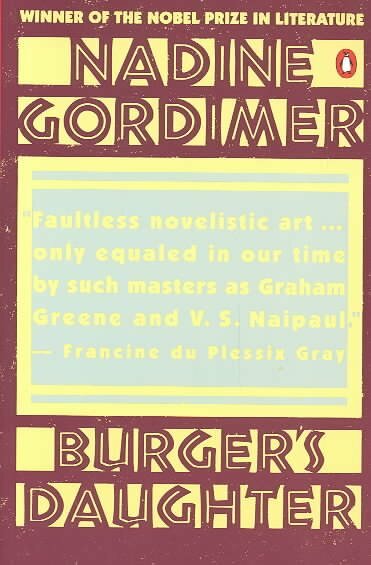 Nadine Gordimer’s 1979 novel Burger’s Daughter is a coded tribute to the legacy of Bram Fischer. Originally banned in South Africa by the apartheid government, it was first published in the United Kingdom. Now it is considered a work of historical fiction from this Nobel Prize-winning author. The central character of this book is Rosa Burger, daughter of the fictionalized, Communist, anti-apartheid activist Lionel Burger, who has recently died in prison. As a woman in her mid-20s, Rosa struggles with what it means to be the daughter of someone who has been labelled a “terrorist” by his own government for acts he committed out of his own conscience. Throughout the course of the novel, Rosa works as a physiotherapist, enters into several love affairs and secretly travels to France to visit her father’s first wife. While trying to lead a semi-normal life, this becomes impossible for her simply because of who her family was and what they stood for. I wanted to love this book, but partially for sentimental reasons. There was mention of familiar places I’ve visited in South Africa — Orlando, Sophiatown, Baragwanath Hospital. There was mention of familiar events — the Sharpeville Massacre and the June 16th Soweto Student Uprising — that resonated with me, not because I was there, but because I know people who were and I have heard there stories. Although this is a work of fiction, there’s frequent mention of real-life people such as Nelson Mandela, John Vorster, Miriam Makeba and even Bram Fischer himself. But for all its possibilities, I only found the book slightly above average. It was not for the content, but rather for structural reasons. There’s frequent shifting between first-person narrative (largely Rosa’s stream of consciousness) and an unknown narrator. When there’s dialogue, it’s noted through dashes rather than quotes, which really bothered me. I oftentimes had difficulty following the narration, and frequently my mind began to wander while reading. If you’re looking for a work of historical fiction on South African apartheid, I’d recommend Alan Paton’s Cry, the Beloved Country over this one. And my favorite recent book on the repercussions of apartheid is Antjie Krog’s Country of My Skull — a factual, journalistic account of the Truth and Reconciliation Commission. That’s too bad – it sounds like it could have been an amazing book. For the first half of your review I was really excited and planning to buy it. Cry, the Beloved Country has been on my list to read for a while… I’ll have to move it up in the standings.